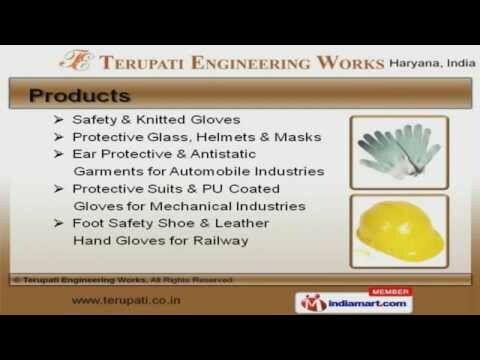 Welcome to Terupati Engineering Works, Manufacturer and Supplier of Industrial Safety Products. The company was incepted in 2005 at Gurgaon. Our products are applicable in Automobile, Cements and other industries. Utmost customer Satisfaction, Durable and temper proof packaging are the plus points of our organization. Protective Glass, Helmets and Masks are some of our products. Our Safety and Knitted Gloves are best in the industry amongst others. We offer Protective Glass, Helmets and Masks that are in huge demand across the global markets. Our Ear Protective and Antistatic Garments for Automobile Industries are a class apart. Along with that we offer Protective Suits and P U Coated Gloves for Mechanical Industries that are cost effective. We also provide Foot Safety Shoe and Leather Hand Gloves for Railway that are extremely reliable.